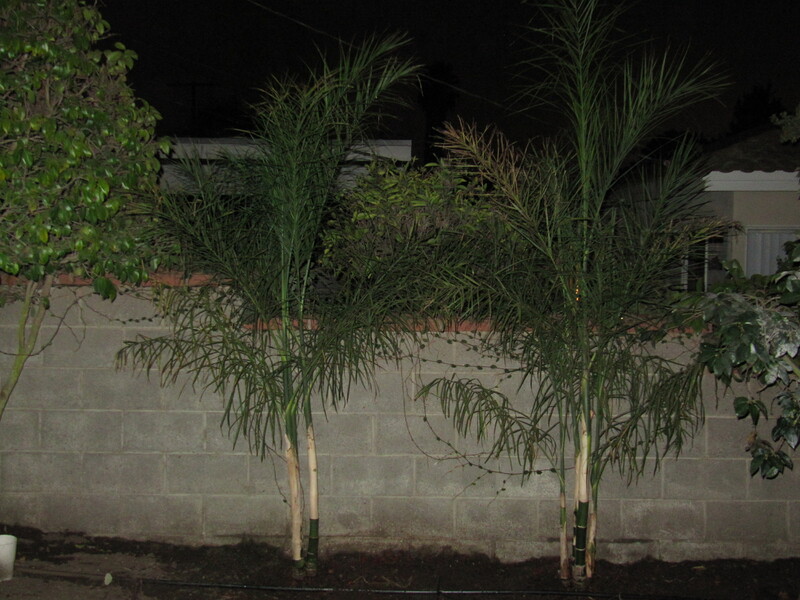 Although the hardscaping is complete for all intents and purposes, we still have to paint the block wall, stain the fence (so new & old sections match), plant some fruit trees and fill the flower beds. I wanted a design plan to use to get bids from landscape contractors, but the landscape designers I called have fees around $2,000 – $3,000. So when I had the opportunity I paid $399 for a Big Deal on Angie’s List. That design is what you see here. I wanted a design plan to use to get bids from landscape contractors, but the landscape designers I called have fees around $2,000 – $3,000. So when I had the opportunity I paid $399 for a Big Deal on Angie’s List. That design is what you see here. I met with many different landscape contractors. I couldn’t find one to do everything we needed, so I had to separately hire a company to install fencing to match the existing fence. Work started in early September and was completed just before Halloween, although the bulk of the work was done within a month. The lot has a slight grade toward the back of the house and we’ve had moisture problems, so an extensive PVC drainage system runs under the pavers and behind the retaining wall. 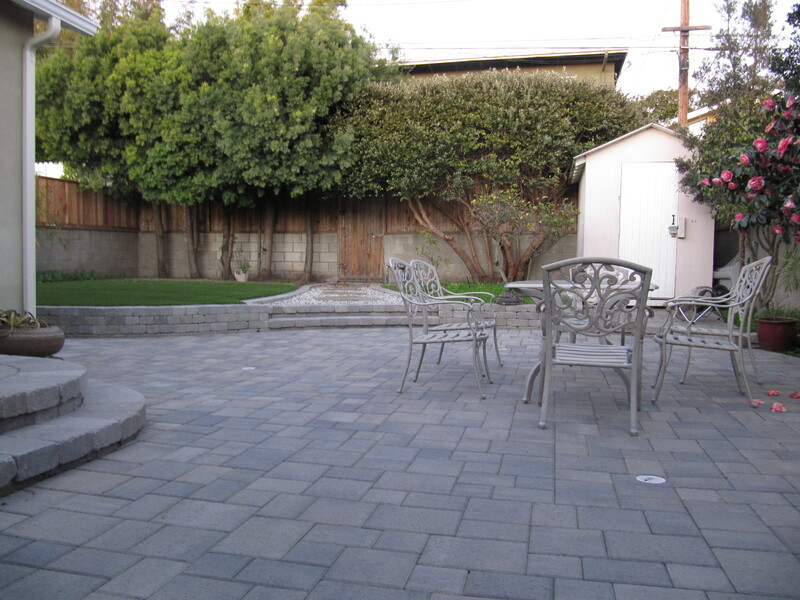 Patio Pavers are Angelus Pavers from Angelus Paving Stone in the Blend Colors Gray/Moss/Charcoal. 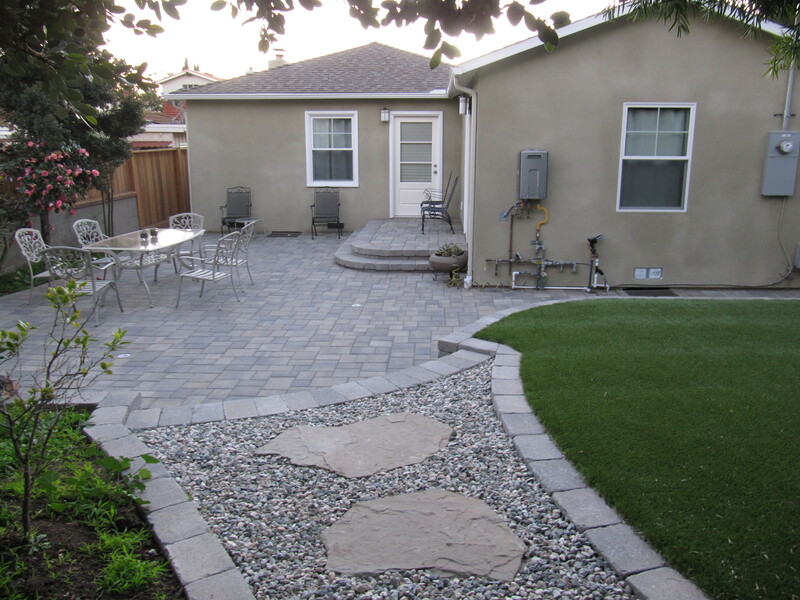 We paid $1500 to get this Polymeric Sand put between the pavers to prevent weed growth. Definitely worth it! The small section of grass is artificial turf. It looks so real and zero maintenance! It’s quite expensive, so best for small areas. Here you can see the project as it progressed.